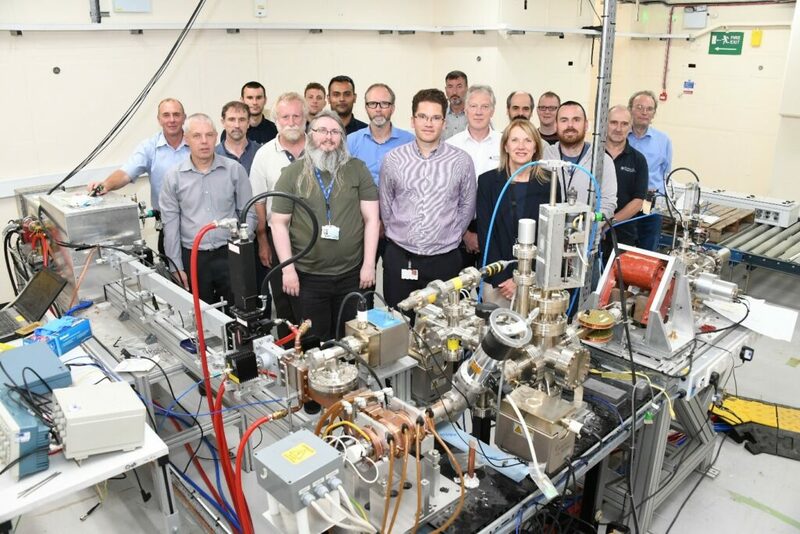 A small scale particle accelerator for security X-ray scanning designed, and commissioned at STFC Daresbury Laboratory and the Cockcroft Institute has successfully accelerated an electron beam to 3.5 MeV. The linac, designed by Lancaster University and STFC Accelerator Science and Technology Centre (ASTeC) and Technology Departments, is optimised for X-ray screening of aviation cargo. These small particle accelerators are designed to fit on the back of a truck and can provide mobile security checkpoints. The new linac can vary its energy between 1-3.5 MeV and has a smaller footprint than other similar linacs. The beam can produce a peak current of 100 mA, and is pulsed at 200 Hz with 5 microsecond pulses. The linac operates at S-band and utilises a 17 keV thermionic electron gun and an S-band magnetron from Teledyne e2v. The RF linac structure utilises a pi mode where every accelerating cell is used, rather than the standard side-coupled design where every 2nd cavity is empty, to reduce the physical transverse dimensions thereby minimising the diameter of the shielding required. X-rays are produced by firing the beam onto a tungsten target to produce bremsstrahlung radiation. An important part of the project is to make a linac with simple controls and feedback, such that the energy and beam dose can be varied by operators at the airport without the need of accelerator scientists, and work in the next few months will be focussed on implementing techniques to accomplish this mode of operation. The linac has similar requirements to radiotherapy linacs and the team are now also looking at similar compact accelerators for medical applications. Dr Graeme Burt from Lancaster University and the Cockcroft Institute who led the linac design said “Particle accelerators are important to the lives of everyone, but most people are unaware of how important they are. R&D into small industrial, medical and security accelerators is vital to making progress in the field of accelerator engineering and ensuring new research in HEP machines is properly exploited in other areas”. After completion, the prototype will be turned into a user facility for industrial and university users to access small industrial type electron beams for research into industrial, security, medical and environmental applications of accelerators run by STFC at Daresbury Laboratory. 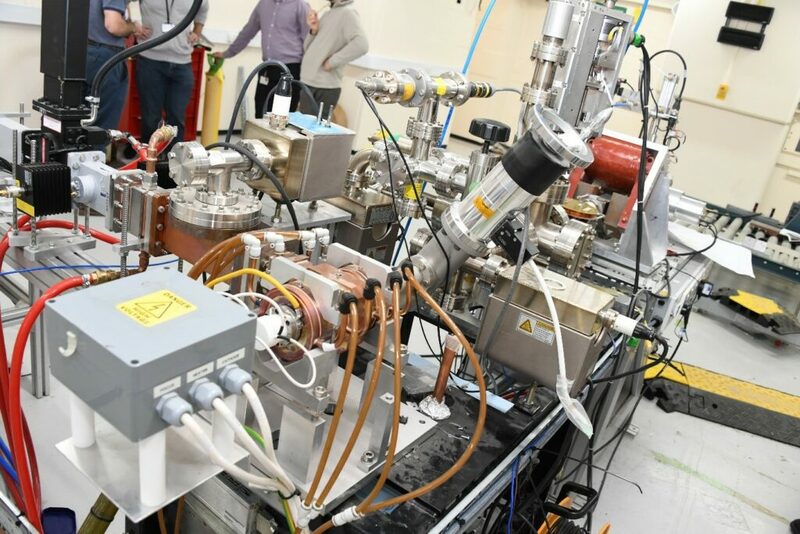 This facility perfectly complements the existing suite of accelerators at Daresbury including the existing 5 MeV VELA beam at Daresbury which delivers high quality, short-pulse, low emittance beams for industrial and academic exploitation purposes. The facility development was funded by the STFC challenge led applied systems programme. Anyone wishing to utilise the facility should contact Dr Donna Pittaway (donna.pittaway@stfc.ac.uk). For further information, please read this article in Accelerating News.